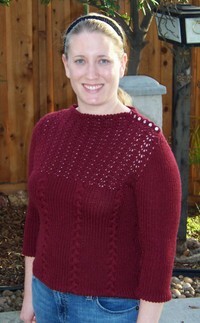 Pattern: Gatsby Girl, by Jodi Green. Published in Interweave Knits Fall 2006. Yarn: Rowan RYC Cashsoft DK in opulence (#521). I used 10 balls leaving almost three left over. Needles: Addi Turbos, US3s and US2s. I had to decrease my needle size due to gauge. 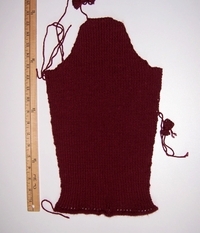 Alterations: I changed the buttonhole size because they were too large when crochet'd as indicated. I also crochet'd on the buttons instead of sewing them on, this was really-really easy! Impressions: I loved knitting Gatsby Girl! The yarn is super plush and comfy. 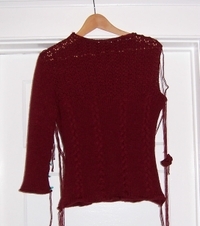 I had the plys split on me here and there, but this was really quite ignorable because of the yarn's loveliness. The pattern is well written, easy to follow, and was interesting enough to keep my attention. Seaming and finishing did seem to take forever, but well worth it. I'm a bit sad that the neckline on mine is not as form fitting or tall as shown in the pattern picture, but I'm over it because I really do love this top! AND I got it done before heading to Stitches West - Woohoo! Sewing down the hem facings along the bottom, sleeve cuffs and neck are left, as well as the crochet portion at the left shoulder and the sewing in of buttons. I have not decided if I'm going to use the project yarn to sew down the hem facings... or if it would be easier to use a coordinating sewing thread. 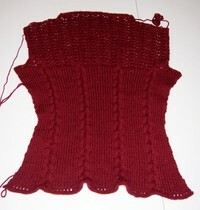 I'm keeping my fingers crossed, but so far it looks like I'll have this one finished in time for Stitches West! It certainly doesn't help that I was thoroughly distracted by a yarn sale at The Grove. Rowan yarns were 50-70% off... I'm certainly glad DH and I were near by when they opened! After a quick phone call to Kris to get the yarn requirements for Pandora (it amazes me that she has most of these things to memory - you're awesome Kris! ), I walked away with the 4-ply soft needed at half price! I'm too lazy to take a picture at the moment, but I have Sooty (#372) as the main color and Irish Cream (#386) as the contrast color (in person it seems to have a lavendar haze to it). Phew... now to just get crackin' on that last sleeve! Andy and I spent the day out and about yesterday, and randomly decided to go to Encinitas. A trip to Encinitas in not complete without a stop by one of the two yarn stores. After lunch at Via Italia, we popped into Common Threads. It was my lucky day as they were having a discount sale - the discount you received off your purchase was randomly determined by the card in a selected balloon that you got to pop!